Charlie Day has spent most of his career on television, with recurring roles on shows like Third Watch and Luis before breaking out with It’s Always Sunny In Philadelphia, but in the past couple of years has found himself more on the big screen, with big roles in movies like Going The Distance and Horrible Bosses. This year, however, is really his chance to shine in the film world. Not only will we soon see him starring in Guillermo del Toro’s Pacific Rim, which is out next month, he has also found himself joining the Pixar family, lending his voice to the oddly-shaped creature Art in the brand new Monsters University. And with the latter movie due out this weekend, I had the wonderful opportunity to talk with the star about his monstrous summer and the future of his career. A few weeks ago I had the chance to fly up to Emeryville, California for a Monsters University press day at Pixar headquarters and got to sit down one-on-one with the rising comedic actor. Check out our conversation below in which we talk not only about his terrific part in the new animated feature, but also the future of It’s Always Sunny, possibly collaborating with co-stars Rob McElhenney and Glenn Howerton on a film project, and the importance of the message in his new movie. When you were doing your voiceover work did you come up here? Yeah, the very first time I got to work on the movie, they brought me up here and I got to do the whole tour and see all the... Have you been around the facility at all? Yeah! I’ve actually been lucky enough to come here a couple times before. There really is an incredible, creative energy here. I have to imagine that has an impact. Oh, absolutely. Well, I think the real trick to being a good actor or anything is to surround yourself by as many people as you can that are far more talented than you are and then really convince people that you are great. Was this something you’ve wanted to do this for a while? This is your first time doing a voice in an animated movie, right? I wanted to do it from the very first time I saw an animated movie. There’s something that they have, some sort of magic in recognizing the actor’s voice, but then seeing a completely new character that they have. I would love it when I heard Billy Crystal or Steve Buscemi or Tom Hanks or any of the actors that I loved voicing these characters and how could you not want to do that? Totally. So was Monsters something you actively went after or did they contact you? No, I didn’t even know it was being made until I got the phone call! That’s a good question. Over a year ago, but I guess they’d been working for years and years and years, but they’re pretty good about keeping secrets up here. So, yeah, I didn’t pursue it, but I would’ve I suppose, if I could’ve. 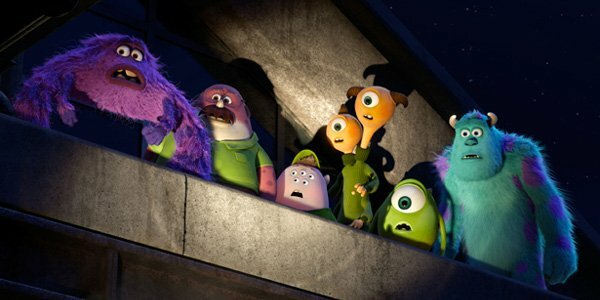 I know that characters in animated movies can change a lot from their first conception to what ends up in the movie. Were you able to see early versions of Art? I was. The very first day I came in, they had the drawing of the character and they had a few clips of how he moved, which is so funny, and each time I went back, they would have more and more and more, which would really get you excited and give you a better picture of what it was that you were trying to do. Did you get to see an evolution of the character’s design changing? They were pretty set in stone with what he was going to look like by the time I showed up. I would like to see early sketches, but I think he’s something that somebody dreamt up and just knocked it out of the park, right away. Art is a really cool character, and his shape adds an awesome physicality. Did that enter into your performance at all? 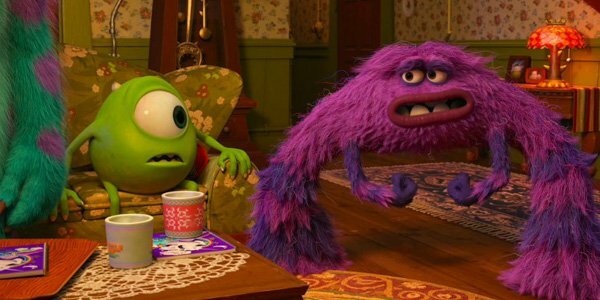 Well, a little bit, because you have to make noises as the character’s moving, so you’re trying to figure out as you’re running and grunting what it would sound like to have two giant legs, but whether or not I pulled that off, I don’t now, but I think that’s all up to the animator. Have you seen the final film? I have, yeah. I really love it. Beyond the voice, do you see your physicality in there too? You know, I didn’t so much, when I saw it. I didn’t, I almost didn’t hear myself, but probably because I’m not used to looking at myself like a fuzzy purple rainbow [laughs]. This is a big summer for you, between Monsters University and Pacific Rim. It’s a monstrous summer, so to speak. That’s actually an awesome way of putting it [laughs]. I think you just gave me my headline, sir. Well, I’m no journalist, but you can use that [laughs]. You’ve been doing television work for most of your career, so is this kind of where you see yourself going? It’s a lot of fun to work with such great people. It’s a lot less pressure than It’s Always Sunny in Philadelphia where if it’s not working, it’s my fault, and I can’t blame anybody else, except maybe Rob or Glenn. So, it’s a little bit more of a free ride. However, I really get off on building something from beginning to end. That’s probably the most rewarding experience. So, if I can continue to do both, I will, and if not, I’ll take just one. As long as I’m doing something. I also have to imagine that having a cable show versus a network show, you’re doing ten episodes versus twenty-four. That has to help out your scheduling a little bit, but do you still find yourself being selective about the projects you take on? Are you actively looking for different kinds of stuff, because what we’ve seen from Pacific Rim is clearly much, much different than Charlie on Sunny. No, I wasn’t actively looking for that at all. The phone just rang, which is the best thing that can happen. Guillermo is such a big Sunny fan, that he called me up. I heard him say that he was inspired by your monologue in the “Charlie Kelly: King of the Rats” episode. Can you believe that? Crazy. I’m actually a huge Sunny fan, and the fact that you’re coming up on nine seasons this year is absolutely phenomenal. And I honestly think that the eighth season is one of the best you guys have put on. The eighth season is maybe my favorite season we’ve ever done. Most shows that are on nine years, you see the degradation, but you guys have just kept it going for so long. You know, it’s a good group of people. That goes a long way, so chemistry is a big part of it, and I think Rob and Glenn and myself, really, really want to do good work, so we are constantly trying to figure out what’s a better and better and better episode of the show. And last year, we still haven’t figured out exactly what makes one great and what makes one just ok, but we’re just trying to get it right. At this point is it kind of a thing where if FX says, “Keep making episodes,” you’ll keep doing it? What’s the show’s future? I think so. I know that we’re definitely doing a tenth season, and then it’s really up to FX whether or not we do more, but I just love those people. I love those characters and I love how happy it makes the fans. It’s the best job. It’s the best thing I’ve ever been a part of, and I think keeping the seasons small, we decided we’d just do ten episodes from here on out, really enables us to make sure that each one is sort of precious and that we put as much thought as we can into them. I think we probably would have burned out if we were doing 22 a year. We wouldn’t have lasted this long. Could you see yourself working with Rob and Glenn on other projects, possibly in the film world? Absolutely, absolutely, and I hope that we do and the three of us keep talking about doing a movie together and it’s a little bit hard to split our focus between... After a season of Sunny, we usually need a break from each other, but I think hopefully we’ll churn out some stuff pretty soon. Just to kind of go back to Monsters University, there’s an incredibly strong and mature message in this film, tackling subjects like self-acceptance and the idea that there are just some things that are out of your control. You have to accept who you are and your positions in life. I’m curious about your feelings on that message, and as a father, what you think that message means for young audiences.